Need the World’s Best Rhyming Dictionary? Rhymesaurus runs on Windows 2000, XP, Vista, and Windows 7 ! Try it FREE for 30 days! Buy Rhymesaurus now for just $12.95! 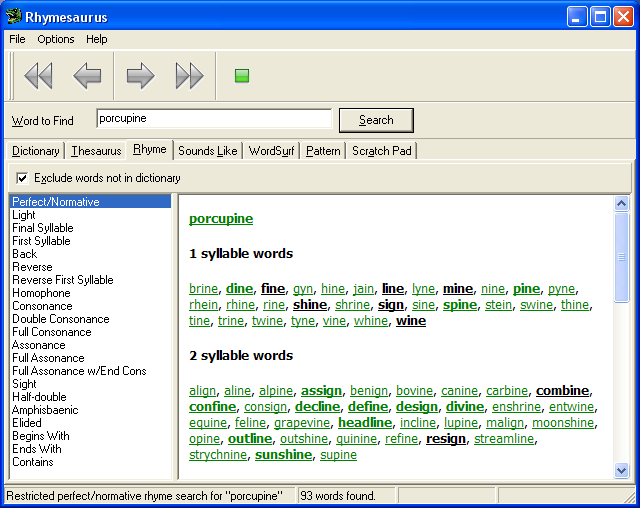 Rhymesaurus is much more than just the world’s most sophisticated rhyming dictionary; it’s a rhyming dictionary, dictionary, and thesaurus, with many more references and lexical tools, all rolled into one. It’s the perfect English-language reference program for songwriters, poets, marketers, and anyone who needs to find exactly the right word. Whether you need to find rhyme words, synonyms, definitions, similar sounding words, or words based on their stress patterns, Rhymesaurus can help. Rhymesaurus includes over 120,000 words in the rhyming dictionary, plus a full 115,000-word Webster’s dictionary,Roget’s Thesaurus, and a useful “sounds-like” reference. 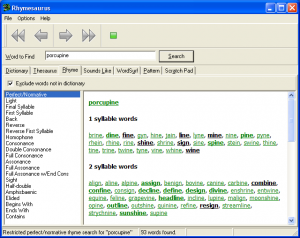 Rhymesaurus even allows you to “surf” the lexical relationships between words, and look up words based on their stress patterns. eThesaurus Free Edition helps you find exactly the right word quickly and easily. eThesaurus Free Edition is not just another WordNet “screen scraper”; it’s the most comprehensive synonym dictionary available for iOS, and all data is stored on your device, so you don’t need an Internet data connection to use it. It even works in Airplane Mode so you can write on the go. 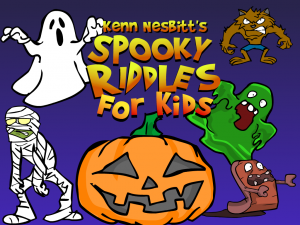 Get ready to laugh as you discover the wonderfully zany poetry of Kenn Nesbitt! You’ll read about the world’s fastest bicycle and meanest pirate ever. You’ll meet a marching band of musical ants, and a dragon who can’t blow out his birthday candles. You’ll learn how not to play with your food, and why you can’t bring a camel to school. 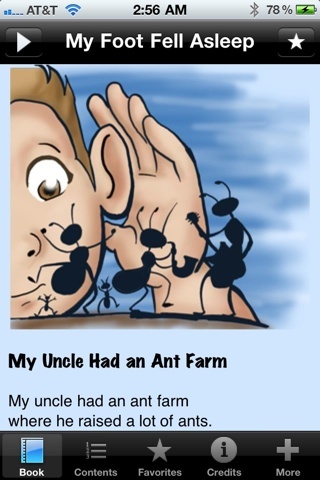 Children and adults alike will want to read these poems again and again. Acclaimed children’s poet Kenn Nesbitt’s first book, My Foot Fell Asleep, is now available for the iPhone, completely reillustrated and with full audio. You can not only read the poems, you can hear them read by the author. Look for more poems by Kenn Nesbitt at Poetry4kids.com. Perfect for Halloween or any time you want to howl with laughter! It’s funny, it’s silly, and just a little bit scary. 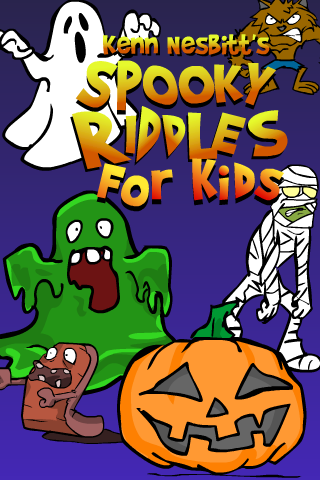 The funniest spooky kids riddles ever collected in one app, and it’s just $0.99. What are you waiting for? Download now and start laughing! RhymeNowHD is designed especially for the iPad and does NOT require an Internet connection. 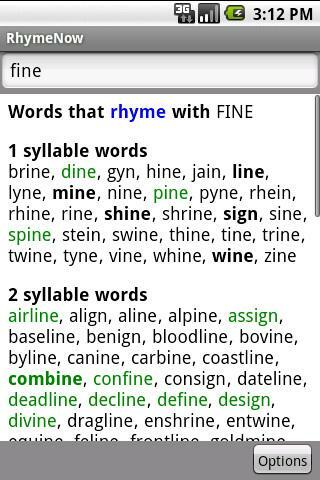 The entire rhyming database is stored on your device so you do not need to be online to lookup words. Buy now for just $1.99! 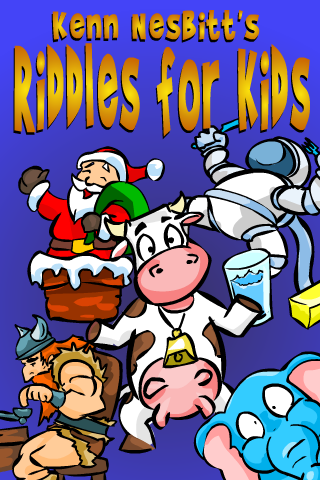 The funniest kids riddles ever collected in one app, and it’s just $0.99! What’s green, and sings? What time is it when you’re on a trampoline? How did Noah see on the Ark at night? Download this app and find out! On each beautifully illustrated riddle, simply swipe the screen to reveal the answer. Click the star to bookmark your favorites. And turn on the music and sound effects for even more fun! RhymeNow is now available for Android smart phones! RhymeNow is designed for mobile phones running Android version 1.6 and higher, and does NOT require an Internet connection. 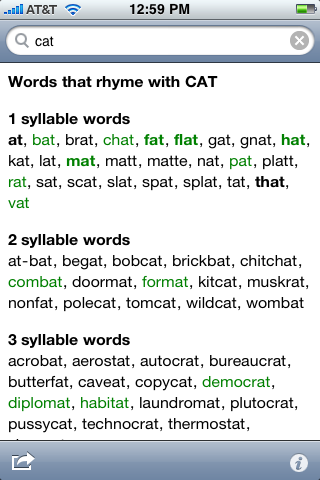 The entire rhyming database is stored on your device so you do not need to be online to lookup words. To purchase RhymeNow for Android, scan the QR Code with your Android device, or view this page on your phone or tablet and click on the QR Code. Writing a poem? Crafting a song? Creating a rap? Need to find exactly the right word? Then RhymeNow Free Edition is the tool for you. 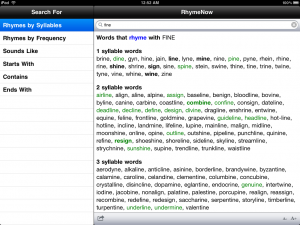 With RhymeNow Free you can quickly find rhymes from a database of 55,000 English words. And best of all, it’s FREE. RhymeNow is designed for the iPhone and iPod Touch and does NOT require an Internet connection. 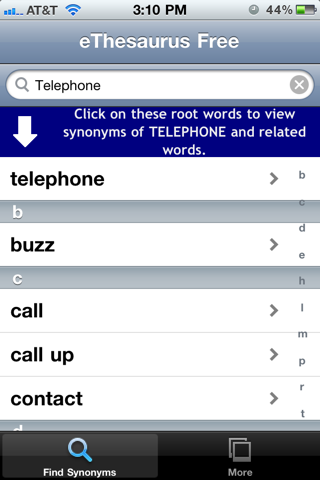 The entire rhyming database is stored on your device so you do not need to be online to lookup words.